When Coca-Cola was introduced in France in the late 1940s, the country's most prestigious newspaper warned that Coke threatened France's cultural landscape. This is one of the examples cited in Richard Kuisel's engaging exploration of France's response to American influence after World War II. In analyzing early French resistance and then the gradual adaptation to all things American that evolved by the mid-1980s, he offers an intriguing study of national identity and the protection of cultural boundaries. The French have historically struggled against Americanization in order to safeguard "Frenchness." What would happen to the French way of life if gaining American prosperity brought vulgar materialism and social conformity? A clash between American consumerism and French civilisation seemed inevitable. Cold War anti-Communism, the Marshall Plan, the Coca-Cola controversy, and de Gaulle's efforts to curb American investment illustrate ways that anti-Americanization was played out. 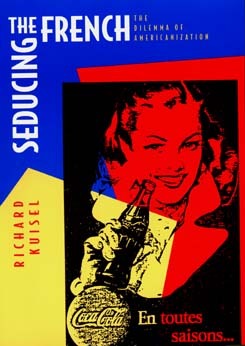 Kuisel also raises issues that extend beyond France, including the economic, social, and cultural effects of the Americanized consumer society that have become a global phenomenon. Kuisel's lively account reaches across French society to include politicians, businessmen, trade unionists, Parisian intelligentsia, and ordinary citizens. The result reveals much about the French—and about Americans. As Euro Disney welcomes travellers to its Parisian fantasyland, and with French recently declared the official language of France (to defend it from the encroachments of English), Kuisel's book is especially relevant. Richard F. Kuisel is Professor of History at the State University of New York, Stonybrook and the author of Capitalism and the State in Modern France (1981).